I'm using Sew Kind of Wonderful's Chic Country pattern for my daughter's next bed quilt, but I'm tweaking it. The original pattern is for a throw, and I needed it to be big enough for a twin bed, so of course I needed to add blocks. Just adding blocks wasn't enough however, because I needed another half block's width extra to get to just the right size, but adding just a half block interfered with the pattern repeat. 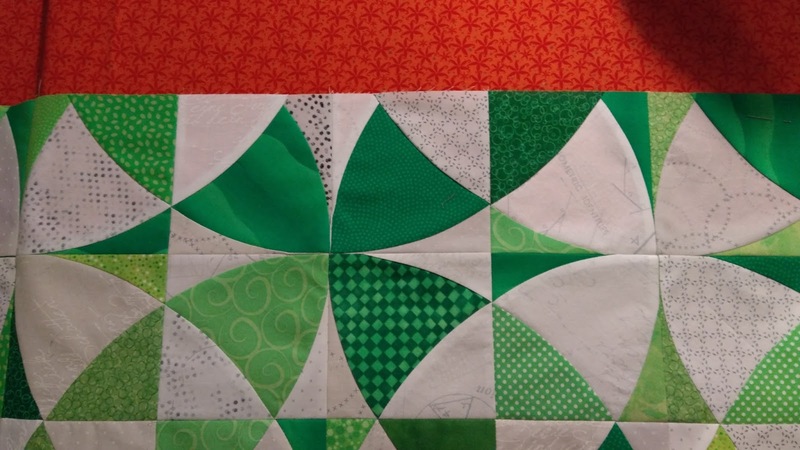 One side of the quilt would look like the top of the first picture below, and the other side of the quilt would look like the top of the second picture. One emphasizes the four petal block, the other emphasizes the secondary circular pattern. They wouldn't match and I'm a matchy-matchy kind of girl! Plus I really like that circular secondary pattern. How about adding borders to make up the extra size? The original pattern went for the modern no-borders look, so I wasn't sure how borders would look. Meh. This isn't very exciting. What about giving up on circles on the edge? This is, maybe, better, but still isn't very exciting. Getting better! I just changed the color of one piece in each of the edge units to make the circles stand out. Oh yes! I like this! Stay tuned! I have just 7 more seams to pin and sew before I can add the orange border and call this a complete top! 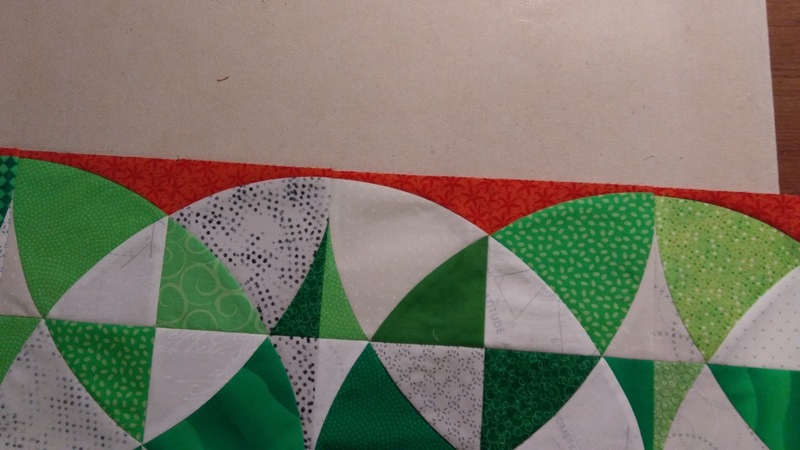 Interesting to see you working through the different options for this quilt..I like how you've worked to get the circles on the edge - have fun! 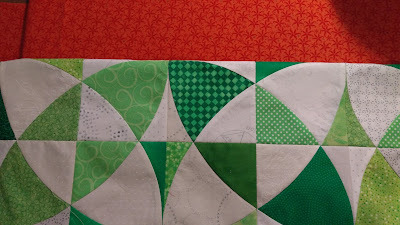 I really like the idea of incorporating the border print into the blocks. It looks great! Ooohhhhh! I love the pop of orange! I can't wait to see the whole thing. That is going to be a nice finish! I really liked your last border idea. That is neat! It definitely looks more *finished* in the last image. I enjoyed your posting the progressive images and thought processes. Oh, I like it! The edges will end up sort of scalloped. Neat! That changed the look completely and I love it even more!